The Moore School of Engineering Office of the Director Records are organized into three series: General, Computer Museum, and Projects. The Projects series is further organized into six sub-series: General, Differential Analyzer Laboratory, ENIAC, EDVAC, MSAC, and Rolled Drawings. All series are arranged alphabetically. The University of Pennsylvania established the Department of Electrical Engineering in 1914 as part of the Towne Scientific School. Prior to that date, electrical engineering had been taught in the Department of Mechanical and Electrical Engineering. Over the next nine years the Department grew steadily within the School. In 1923 the University was approached by the Board of Trustees for the Alfred Fitler Moore Estate with the proposal of establishing a school of electrical engineering in Moore’s name with financial assistance from his will. The school officially opened in 1924 as the Moore School of Electrical Engineering. 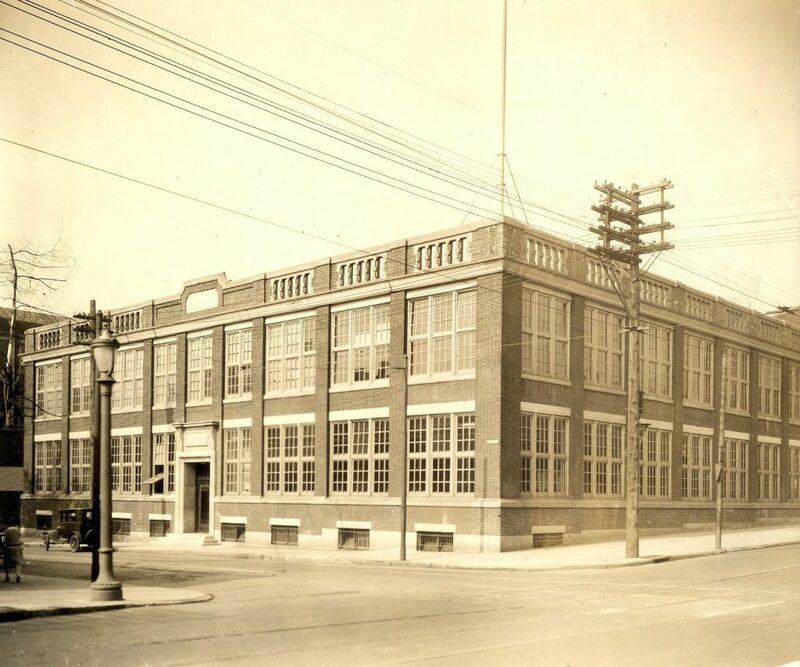 Initially housed in the Towne School Building, the Moore School moved into the renovated Pepper Musical Instrument Factory on the corner of 33rd and Walnut Streets in 1926. In 1935 the Moore School completed the Differential Analyzer – the world’s largest mechanical computation machine. The reliability of the Analyzer resulted in contract work for various University departments, private companies, and government agencies. In the early 1940s the Army Ballistic Research Laboratory contracted the Differential Analyzer to calculate artillery firing tables. From this work came the contract for the school to design and construct ENIAC (Electronic Numerical Integrator and Computer) in 1943. The Moore School would go on to design EDVAC (Electronic Discrete Variable Automatic Computer) in 1946 and MSAC (Moore School Automatic Computer) in 1950. In 1973 the University restructured the engineering schools as the School of Engineering and Applied Sciences – with the Moore School again becoming the Department of Electrical Engineering. During the time of its existence, there have been five directors of the Moore School: Harold Pender (1923-1949), Carl C. Chambers (1950-1953), John G. Brainered (1954-1970), Harvey L. Garner (1970 – 1976), and Joseph Bordogna (1977-1981). In 1981 Dr. Bordogna became dean of School of Engineering and Applied Sciences. The Moore School of Engineering, Office of the Director Records documents the activities of the Moore School of Electrical Engineering during the early twentieth century. Of particular note is the schools early involvement with computers: notably ENIAC, EDVAC, and MSAC. The General series contains records related to the administrative and academic activities of the school, particularly during World War II. The Computer Museum series focuses on the efforts of the Moore School in the 1970s to establish a museum and archive on the school’s work on early computers. This museum, to be housed in the Moore School Building, did not advance beyond the design phase. The Project series documents a number of the Moore School’s major research projects from the 1940s to 1950s, many of which were funded by the federal government. The Projects series is organized into six sub-series that focus on the work done by the school between the 1930s and 1950s, most notably relating to the Differential Analyzer Laboratory, ENIAC, EDVAC, and MSAC. These sub-series contain reports, research notes, correspondence, and drawings related to the design and operation of the specific systems. The General sub-series contains reports, drawings, research notes, and correspondence for projects that can not be assigned to one of the five major projects noted above, or relate to multiple projects (such as with ENIAC and EDVAC). The Rolled Drawings sub-series contains a series of rolled blueprints and mechanical drawings from various projects. Every effort has been made to group all records together based on project number and / or name. Those which could not be attributed to a particular project were grouped into the Projects General sub-series. Many of the drawings and blueprints in this collection are oversized, and beyond the ability of the University Archives to reproduce in-house. United States. Army. Ordnance Department. University of Pennsylvania. Moore School of Electrical Engineering. Algebraic Determinations of Branch Contours n.d.
Alphabetical List of Filing Categories n.d. Catalog of Drawings (1) n.d. Catalog of Drawings (2) n.d. Catalog of Drawings (3) n.d. Charging Circuit for Batteries n.d. Complete List of Reeves Reader-Recorder Drawings and Prints n.d.
Current Expenses and Increase in Plant n.d.
EDVAC and ENIAC Patent Survey n.d.
Fiftieth Anniversary Celebration Committee List n.d.
Manuals for Library File n.d.
Report 58-27 Tables 2.1-2 and 2.2-1 n.d. Shifting Counter Office of Naval Research Record n.d.
Zadeh, L. A. “Contribution to the Theory of Nonlinear Systems” n.d.
Moore School Photographs and Drawing n.d.
Museum Rendering Photographs and Slides n.d.
5059 Test Roll Graphs n.d. Appendix: Graphical Analysis of Transistor Switching Circuits n.d.
Ballistics Graphs – Drawings n.d.
Drone Target Coordinate Transformation Problem Appendix G n.d. Flight Simulator Drawings (?) n.d. Flight Simulator Slide List n.d.
Harmonic Analyzer Modifications of Page Printer n.d.
Harmonic Analyzer Rough Sketches n.d. Memo – Multi-Cockpit Studies and Preliminary Description of Multi-UDOFT n.d.
MS 5054 – Drawings n.d.
Parallax Computer Drawings Unidentified n.d.
PZ No. 5 Drawings n.d.
PZ No. 5 Special Cross-section Paper n.d.
PZ Tables of Numerical Value Witmer n.d.
Reel Calculations H. Mancuso n.d.
Special Devices Center Programing of Flight Equations n.d. Unidentified Notebook – radar, missiles, aircraft n.d.
Wire Drive – Drawings n.d.
48-29-25 Two Phase Ampligen and Induction Motor n.d.
48-52-18 Applied Physics Laboratory n.d.
48-52-27 Applied Physics Laboratory n.d.
48-52-28 Applied Physics Laboratory n.d.
48- -24 Brown’s Problem n.d.
49-52-1 Applied Physics Laboratory n.d.
49-52-3 Applied Physics Laboratory n.d.
49-52-10 Applied Physics Laboratory n.d.
49- -4 Harmonic Analysis n.d.
4828 Variable Parameter Circuit Problem n.d.
5007-4-50 Back Lasli Problem n.d.
5105-1-51 Applied Physics Laboratory n.d.
Astronomical Problem (Green Haverford) n.d.
Data on Polar Table n.d.
Hare – Vaunder Pohl n.d.
Home – S. B. Hare n.d.
Job Setup From D. A. Booklet Saturation n.d.
MF Pender and Wygant n.d. Partial D.E. Problem II n.d.
Prints of Electronic Equipment Blueprints n.d. Problem from Joor Tank n.d.
Solenoid Tripping Mechanism Blueprints n.d.
Varying Parameter Problem 700-1-3 n.d. Analysis of Chronological Resume of Available Patent Correspondence n.d.
Design of Electrical Delay Lines – Rough Outline n.d.
Notes for Maintenance Personnel n.d. Photograph Being Prepared to solve a Hydrodynamical Problem [thank you note from dean to Moore School, signed] n.d.
PX – Catalogue of Drawings n.d.
PX – Stock Index n.d.
Technical Description of the ENIAC Part I (1) n.d.
Technical Description of the ENIAC Part I (2) n.d.
Technical Description of the ENIAC Part II n.d.
Air Cooling Technical Specifications – draft n.d.
Automatic High-Speed Computing: A Progress Report on the EDVAC n.d.
Axial Flow With Rotation n.d.
Cables Originating on Control Panel n.d. Catalog of EDVAC Drawings n.d. Circuit Diagrams – Drawings n.d. Clippings 4th Order Method of Integration n.d.
Computation of an Exponential of Trigometric Function on the ENIAC n.d.
Computation Size of Nos-Boat-Tail Cone Cylinder n.d. Contractor Guidelines – draft n.d. Drawings: Memory Cabinet Lists n.d.
Glass Lantern Slides – EDVAC n.d.
Glass Lantern Slides – Pilot Model EDVAC n.d.
Graphs of Various Functions Associated with Shock Waves n.d. Instructions to Bidders Air Cooling n.d.
Main Items for the EDVAC Switchgear n.d.
Newton-Gauss Interpolation and Taking Fourth Differences n.d. Numbering System for EDVAC Drawings n.d.
Operating and Programming Manual for the EDVAC n.d. Pilot Model EDVAC Drawing n.d.
Power Control Component for 1 Machine n.d.
Project 5057 Original Copies of Reports (1) n.d.
Project 5057 Original Copies of Reports (2) n.d.
Summary Description of the EDVAC n.d.
Two Word EDVAC Arithmetic n.d.
Diode Cluster Layout Sheet [blank] n.d.
Dr. Rubinoff Print of Figure 2.1-1 for NE 77 Memo n.d.
Errata and Additions to Previous Reports n.d.
Flip Flop Rough Schematic Master Tracings n.d.
Flip-Flop and Cathode-Follower Technical Memorandum n.d.
General Rules Diode Disconnect n.d.
Glass Lantern Slides – H.J. Gray Som. Of Mathieu’s Equation n.d.
Glass Lantern Slides – Talk No. 79 (1) n.d.
Glass Lantern Slides – Talk No. 79 (2) n.d.
Glass Lantern Slides – Unidentified (1) n.d.
Glass Lantern Slides – Unidentified (2) n.d. Input Admittance of Crystal Gating Circuits in Micromhos vs. Coaxial Cable Length n.d.
Local Flip-Flop Disabling Switch n.d.
Miscellaneous Calculations and Drawings n.d.
MSAC Pulse Power Amplifier Technical Memorandum (1) n.d.
MSAC Pulse Power Amplifier Technical Memorandum (2) n.d.
New X’tal Cluster Base n.d.
No. 8 Xtal Clusters n.d.
Obsolete Crystal Clusters 4822 n.d.
P Pulses and EX n.d. Padding Resistors vs. Nominal Delay n.d.
Power Supply and Distribution for MSAC n.d. Proposed Layout of MSAC Racks and Chassis n.d.
Pulse Power Amplifier Technical Memorandum n.d.
Pulse Xfmrs M. Pleasure n.d.
Quarterly Progress Report #11 Table 4.3-3 n.d.
Quarterly Progress Report No. 5 Drawings n.d.
Summary of Pulse Transformer Construction Data n.d.
Summary Report of MSAC Power System Progress n.d. Weather Prediction Machine Photographs n.d.
Work on Register Code n.d. Worksheets and Test Problems n.d.
Zeta Function of Riemann n.d.
104 Related Drawings [8 sheets] n.d.
B-4817, 4819, 4851, 4855, 4861, 4867, 4875, 4932, 4980 [30 sheets] n.d. Charts and Diagrams Negatives n.d.
Computer Generated Frequency Plots [19 sheets] n.d.
“Fig” Payroll Computations; logic diagrams [8 sheets] n.d.
Fire Control [13 sheets] n.d.
Fire Control Equipment, Navy Ordnance Department [15 sheets] n.d.
Miscellaneous Drawings [12 sheets] n.d.
MSAC 104-1EC to 104-10EC [30 sheets] n.d.
MSAC 104-1MC to 6MC; 8MC to 11MC [86 sheets] n.d.
MSAC 1LC, 1LD, 2LC, 2LD [43 sheets] n.d.
MSAC 3LC – 3LD [30 sheets] n.d.
Multichannel Electric Chronograph 5514-MB [58 sheets] n.d.
Navy Contract, Attenuation [42 sheets] n.d.
Pictures of Dolls [8 sheets] n.d. Plots of E [5 sheets] n.d.
Project Numbers 5061, 5250, 5310, 5314, 5317, 5529, 5053 [65 sheets] n.d.
Reference Charts [10 sheets] n.d.
SK-100, SK-106-108 Thysatron [4 sheets] n.d.
Van der Polequation [17 sheets] n.d.
Standard Brand Electron Tube 6D6 with box n.d.